Get ready to switch to the new iPhone 6S / iPhone 6s Plus? Just got a new phone and don’t know how to copy data from the old phone to the new one? And what to do if you are Android user transitioning to Apple? 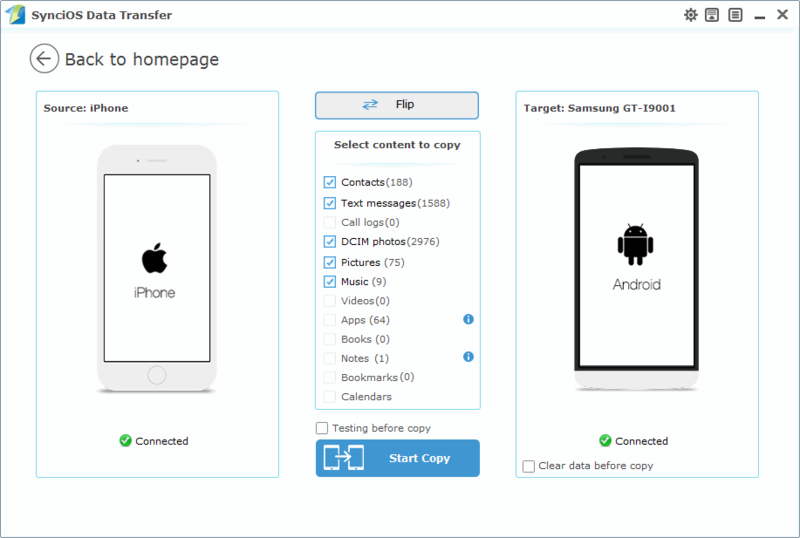 This phone to phone transfer tool is what you need! Syncios Data Transfer provides simple yet effective solution for transferring content between Android and iOS. Transfer almost all files, including contacts, videos, text messages, photos, call logs, music, and more between phone to phone without any data loss. Transfer from iOS to Android, Android to iOS, Android to Android and iOS to iOS are all allowed. You can now just simply connect both your phones to PC and enjoy the data shift between multiple phones in one click. Just have one phone in your hand? It doesn’t matter. You can backup your phone to the PC first and then restore to any other supported phone whenever you want. All in one click to backup all Android and iOS phone data to PC, including contacts, SMS, call logs, photos, music, videos and apps. And then you can transfer the backed up files to any new phone. Cross-platform supported. You can even manage your iTunes backups with Syncios Data Transfer. It not only allows to restore from iTunes backup easily, but also to retrieve iTunes backup and transfer contacts, text messages, photos, video, etc. to any supported mobile device. What’s more, you can transfer songs and playlists from iTunes Library to an Android phone, iPhone, iPad and iPod touch. It works perfectly with almost all Apple and Android devices: iPad, iPhone, iPod, Samsung, HTC, Sony, Motorola, LG and more. Download and install Syncios Data Transfer onto your Windows PC. If you are looking for a perfect phone to phone transfer tool, Syncios Data Transfer will be the best choice. Please note that iTunes should have been installed on your PC to make Syncios work and manage iOS files. No need to run iTunes. Android: Samsung, HTC, LG, Sony, ZTE, Motorola, Huawei, and others. Thanks to Anita from Anvsoft who provided me 10 license codes of SynciOS Data Transfer which originally charges $29.95. The giveaway campaign runs from October 19th, 2015 – October 30th, 2015 and all you have to do is to follow the giving below rules to participate in this giveaway. [Updated Nov 19th, 2015] This giveaway is already over and as there are ONLY 5 participants on this giveaway so everyone is going to get the license code within a 3 days. If you guys wont get it then please contact me or drop an email to me. Thanks GOD, I reached within time. Joined the giveaway. Sir, I am a regular visitor in your website. I often take part in giveaway software program. I have won some of them.So I am really grateful to your website.I like your website very much.I think your website has already much familiar with so many people around the world for the purpose of giveaway sofetwares and so on.I hope your website will always be side by the enormous visitors like me. Thanks. Thanks for your kind words. Didn’t you take part on this giveaway? Also spread about the giveaway in your Social Network.